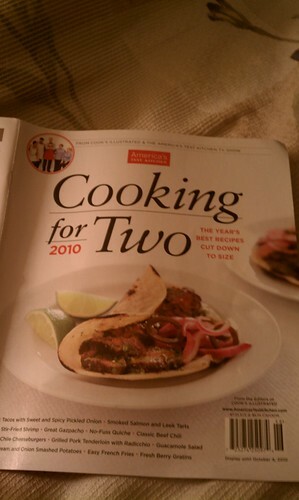 I picked up this special "Cooking for Two 2010" issue of America's Test Kitchen (ATK) during one of my visits to Whole Foods a few weeks ago, thinking it'd be useful for when Marcus and I decided to make dinner back at his apartment. Upon my first perusal, I found some pretty useful recipes in there (e.g., pan-roasted filet mignons with asparagus, pork schnitzel, open-faced poached-egg sandwiches), which were properly adjusted for the appropriate amount of ingredients needed for two. Two Fridays ago, I thought back to this initial perusal of the magazine, trying to figure out what I wanted to surprise Marcus for dinner that night. I suddenly remembered there was an osso buco recipe in there somewhere. My aunt, Cynthia, is an amazing cook, and I absolutely love the osso buco she makes on occasion. I've always wanted to learn how to make it from scratch, but she always told me it's a lot of work to make. I was up for the challenge, especially since America's Test Kitchen's aim is "to develop the absolute best recipes for all of your favorite foods" by testing recipes 30-70 times (depending on the recipe), "yielding the best, most full-proof recipe"--kind of like the Consumer Report magazine for all your cooking and recipe needs. I told Marcus that what I was making for dinner that night was going to be a surprise, and that he'd have to wait until he got home to see what was cookin' ;]! I called Whole Foods in Tribeca to make sure they had veal shanks in stock that day, and I was in luck--they did! So I made a trip up to Whole Foods for the two veal shanks, couple celery ribs, a single carrot, a vidalia onion, a lemon, and tomato paste, as I already had farfalle pasta, olive oil, low-sodium chicken broth, garlic, unbleached flour, bay leaves, and parsley (didn't want to buy fresh parsley and waste the majority of it as I probably wouldn't be using it again for a while) back at the apartment. 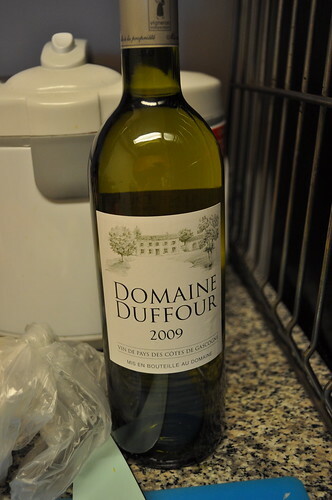 I picked up this dry white wine from Chamber Street Wines (on my way to Whole Foods, conveniently), as recommended by one of the wine experts there. It's a small little wine shop with a very boutique-y feel to it, as it mostly carries foreign wines. At $8-9, I couldn't really go wrong with this. Before I started cooking, I preheated the oven to 325 degrees Fahrenheit. The two beautiful pieces of veal shank. 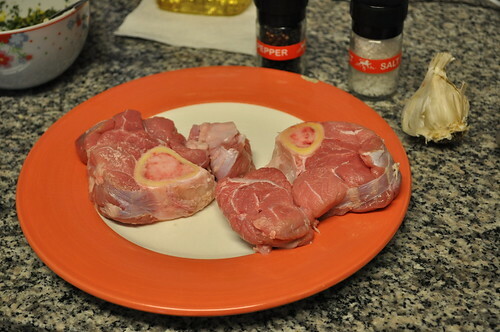 As I love inserting a little history/background in every post, ossobuco is Italian for "pierced or hollow bone", as it refers to the large piece of marrow in the middle of the shank bone (c'mon, look at that precious pink bone marrow waiting to be braised, cooked, and savored!). Ossobuco is actually a specialty dish from Milan, which is braised in meat broth, flavored with white wine and vegetables. Another thing to note is that the traditional ossobuco was not prepared with tomatoes (the commonplace practice today), as they were a "New World" vegetable. Instead, it was prepared with allspice, cinnamon, bay leaf, and gremolata (a mix of parsley, garlic, and lemon zest). 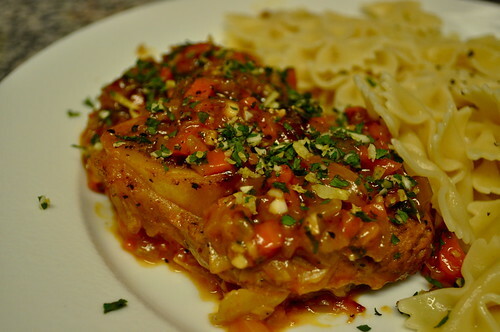 The modern osso buco recipe now includes tomatoes and the "holy trinity" of Italian cooking: celery, carrots, and onions, seasoned with herbs instead of the aforementioned gremolata. The recipe furnished by ATK is a hybrid of both traditional and modern recipes, which I actually find to be a great balance. 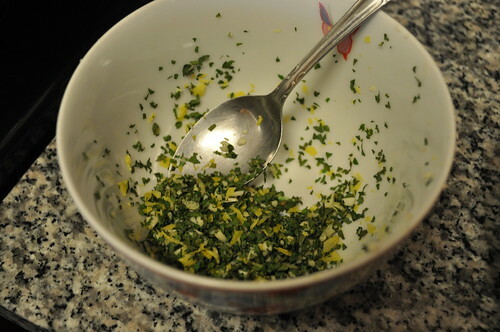 This is the gremolata that I prepared, which includes: 2 tablespoons of minced parsley, 1 minced garlic clove, and 1/2 teaspoon of minced lemon zest. A tip given by ATK is to use a vegetable peeler to remove the zest from the lemon and then mince these pieces using a chef's knife, all to avoid the lemon's bitter white pith. It was a great tip because it worked perfectly. If they hadn't noted that, I probably would've struggled with the lemon zester I would've used. 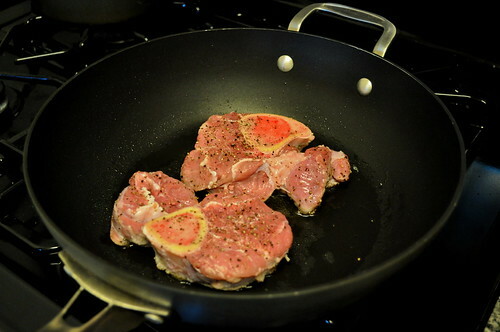 I seasoned the two veal shanks with some salt and pepper and browned both sides in olive oil for about 10 minutes. I removed them to a separate bowl. Off the heat, I added 1/3 cup of the white wine to the saucepan, scraping any browned bits into the mix, then poured over the bowl of browned shanks. 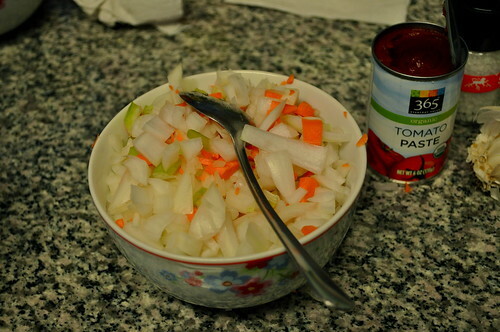 Finely-chopped "holy trinity" of ingredients, along with tomato paste. 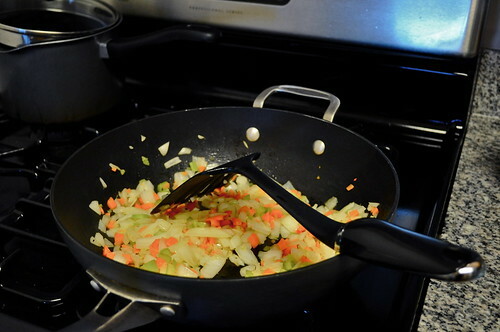 I sauteéd the vegetables until softened and browned, for about 10 minutes. 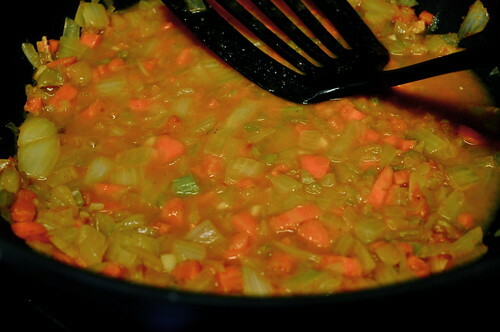 I then added a tablespoon of tomato paste and 2 minced garlic cloves, and cooked for about 30 seconds. Next, I stirred in 2 teaspoons of unbleached flour and cooked for another 30 seconds, then whisked in 3/4 cup of low-sodium chicken broth, the remaining 1/2 cup of white wine, and one bay leaf. Finally, I added back the browned shanks to the pan, along with any accumulated juice/wine mixture from the bowl, bringing it all to a simmer. I covered the saucepan and transferred it to the oven, cooking it for about two hours. 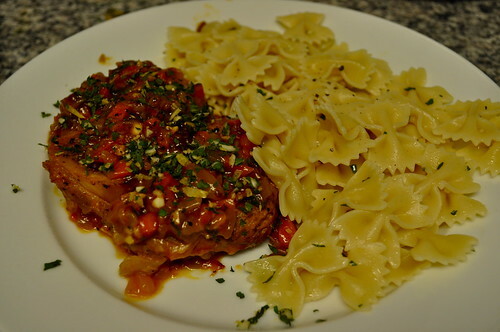 During the last 30 minutes of cooking time in the oven, I made half a box of farfalle pasta (adding salt and olive oil to the boiling water) to serve along side the veal shanks. I was supposed to follow the rest of the recipe, but I didn't have enough tools to do so. The rest of the recipe instructed that I transfer the shanks to a separate plate, strain the braising liquid through a fine-mesh strainer, discarding the solids. 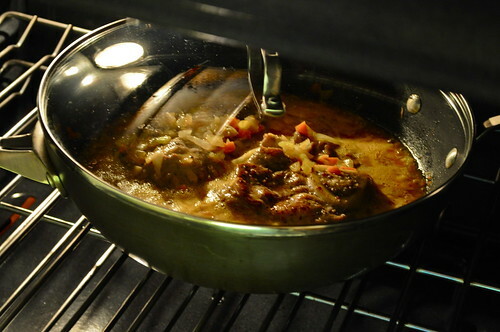 Then I was to return the braising liquid to the pan and simmer until thickened over medium heat for about 6 minutes. It seemed to be so much work already as prepping and cooking added up to about three hours, total, so I skipped that completely. So voilà! A lovely close-up of the completed recipe--boy, was that bone marrow so savory, rich, and everything you can ask for in an Italian delicacy! Findings: I'm still in shock that I was able to execute this dish very well (excuse my minimal gloating, hehe)! The meat was very, very soft, literally falling off the bone. It wasn't overcooked at all, even in the slightest, which is what my main concern was, as it was cooking for 2 whole hours. But it came out so delicious (as evidenced by food coma that transpired after dinner for Marcus)! Even though this is the first recipe I've used from ATK, I will definitely look to them for sources of new recipes, for sure, as it seems that they know what they're doing when it comes to cooking, technique, and ingredients! In any case, I would love to try the last few steps of the recipe according to ATK to assess the difference between the two ways in order to see if it enhances the dish in any way. I highly recommend this recipe for anyone who may think that making osso buco is super complicated (don't get me wrong, it usually is), but ATK breaks it down to simple instructions and techniques that will make it hard for you to diverge too much from the recipe! This whole cooking experience really emphasized the importance of mise en place (French for "put in place"), pretty much meaning prepare your ingredients before you start cooking. One, it saves you SO much time, and two, it precludes you from scrambling in a frenzy to get everything ready while trying to execute steps of the recipe. This way, cooking will be so much easier, and you can focus your energy on the ingredients cooking at hand. Price point: $7.99 for "Cooking for Two 2010" issue of America's Test Kitchen, which includes a little over 60 recipes for two; $8.99 for dry white wine for cooking; $15.72 for two veal shanks (about 6-8 oz. each).